The last couple of weeks I've been working on and off learning how to create a MIDI backup band for my harmonica. I discovered that there are quite a few .kar files on th internet. These are MIDI files with lyrics that are usually used for singing karaoke. You can turn the lead instrument off and sing along with the band. I downloaded a few tunes including this one. I'm using Logic Express on my old MacBook as my audio editor and mixing board. I first converted the .kar file to a standard MIDI file using QuickTime 7 Pro. I then imported the MIDI file into Logic. Each instrument comes in as a separate track. I didn't like the sound of the general MIDI piano. So, I changed to the piano sound from my Kruzweil PC88 keyboard. To do this I output the MIDI to my keyboard, plugged the audio outs of the keyboard into the MacBook and recorded the piano as an audio track. After a lot of research, I figured out how to change the audio inputs for Logic from the Macbook's built-in input to a USB mic so I could then record my harmonica. It was NOT easy or intuitive. Logic does not see a USB mic when it's plugged into the Mac. You can see it in System Preferences, but you can't in Logic. You have to first use the Audio/MIDI Configuration tool in Utilites to create a new device call it USB Mic, assign the input to the USB mic and output to the speakers.Then in Audio Preferences in Logic you can choose the new device. I also learned how to apply reverb, compression, and other effects to a track in Logic. There are multiple ways to do this. The best way is to use the Send feature to send the output of the track to an auxiliary channel and set the effects in that channel. The MIDI file I found was in the key of F. My harmonica is a C harmonica. I had to figure out how to transpose the MIDI tracks to the key of C. You would think that you could do this globally with one click, but no, you have to set it for each track. Finally I figured out how to change the tempo. I wanted to record the harmonica at a reduced tempo and play it back uptempo. You can do this by checking the Follow Tempo check box in the parameters of the track. Logic does a pretty good job of altering the tempo of an audio track as long as you don't try to do too much. I recorded at 40 bpm and upped it to 60. I practiced and recorded the song using headphones and played along with the other instruments. It's hard. I'm not used to playing with other instruments and sticking to a set tempo. Hopefully I'll get better with practice. You can use Logic's Bounce feature to output the mix and normalize it. I then used iTunes to change the AIFF file to MP3. I'm learning the song “Summertime” on the chromatic harmonica. I did this brief recording in the barn using my iPod Touch and the Multitrack DAW app. I emailed the file to myself and opened the file in TwistedWave on the iPad so I could edit it and convert the file from m4a to mp3 and FTP the file to my blog server. It’s been a while since I recorded a harmonica practice. Here’s about 10 minutes of me practicing on the diatonic and chromatic harmonicas. Recorded with my iPod Touch in my lap using TwistedWave audio recording app set to 44 kHz Mono. I did a bit of editing later using MultiTrack DAW. Another song by the Blodget family. Bob on dulcimer. Marilyn on guitar. Jim on harmonica. Jamming’ with Bob and Marilyn – dulcimer, guitar, and harmonica. Dad liked this one. I’m in California visiting family. Here’s the very first song we tried playing together. My brother Bob is on dulcimer. His wife Marilyn is on guitar, and I’m playing harmonica. I recorded it on my iPad using the built-in microphone. This is the first take with no practice. This is a test of the new GarageBand on my iPad 3. I used the iPad’s built-in mike and added a bit of reverb in GarageBand. Just a little going away song for Loraine. I recorded this with an iPad 2 and a Blue Snowflake USB mic. I then uploaded it directly to YouTube from the iPad. Thanks and good luck Loriane. How many songs do you “know”, but “don’t know”? This tune suddenly appeared during my harmonica practice. I knew the melody. I knew that it was a love song from a show or movie, but I didn’t know the title or most of the lyrics or who sung it. Can you place it? Here’s a big hint. First person to peg it in the comments gets 10 points. And you know what points mean! I found this lively rendition of Dardanella on Archive.org. 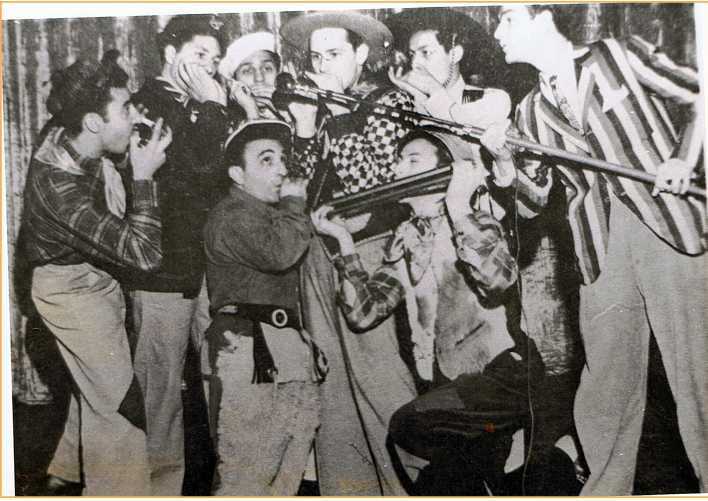 It’s played by Borrah Minevitch and his Harmonica Rascals. First a little background. Shenandoah was one of the first songs I learned to play way back when I was 13 or 14 years old. I’m playing it now on the same 10 hole Hohner Chromatic “C” harmonica I had back then. I’m using the tongue blocking technique to play single notes. 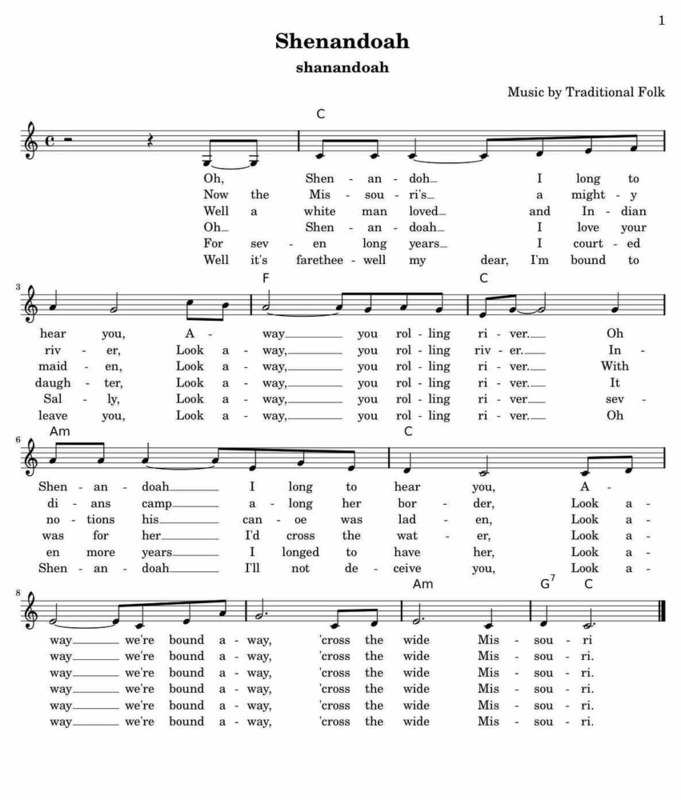 I found the sheet music for Shenandoah on the Wikifonia.org website. The cool thing about this site is that you can transpose the music into any key. It was originally in the key of D with two sharps. I have a “C” harmonica so I transposed the sheet music to the key of C.
Notice the music gives the guitar chords. So, I was able to use the Smart Guitar instrument in Garageband on the iPad to create the guitar accompaniment. I set the the Tempo to 68 beats per minute. I then used my Blue Snowflake USB microphone to record my harmonica in a second track. I did it in real time with no editing. This took a fair amount of practice and several tries. I had to learn to play to a metronome and accompaniment. It takes some getting used to playing in time with feeling and dynamics. I used headphones and monitored both the guitar track and the microphone. Afterwards I set the Pan for the guitar track a little to the left and the Pan for the harmonica a little to the right. This separates the sound into a stereo field and makes it sound like two musicians standing side by side. I also set each tracks’s echo and reverb independently. Finally I duplicated the first section to make the song repeat. Just a little song for for those mornin’ blues. I recorded this on my iPad using its built-in microphone. I created it in MultiTrack DAW with two tracks – one for the harmonica and one for my voice. I had to piece it together from two different recordings. It is heavily edited. It will be a while before I can play and sing at the same time like Buster Brown. 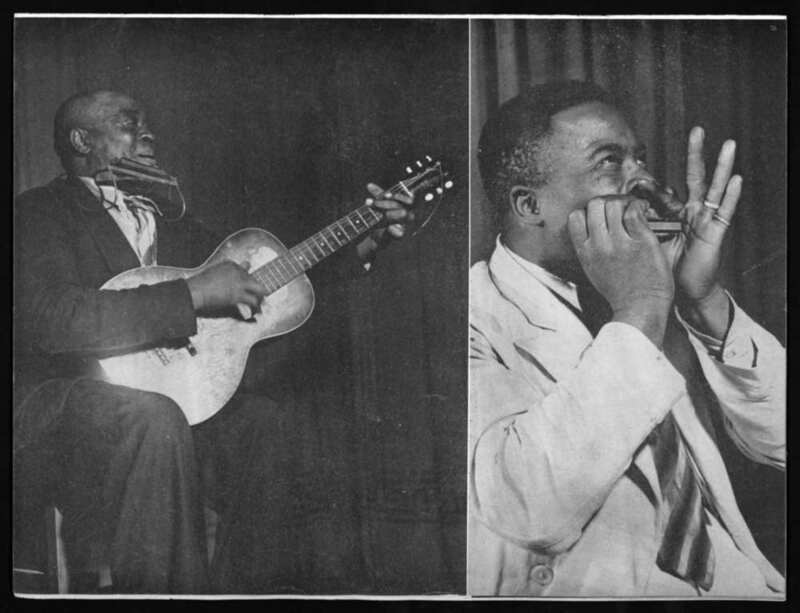 I found this recording at the Library of Congress’s website in their Fort Valley Music Festival collection. Take a break and enjoy listening to the real deal. There’s a honeymoon phase whenever you try something new. The first few weeks you’re enamored and then you realize that this is a long term commitment. It’s easy to drop the ball. It’s hard to maintain dedication once the novelty has worn off. The more you learn the more you realize how much more there is to learn. It’s daunting. I was sick for the last two or three weeks. So, I laid off playing the harmonica. I’m finding it hard to get back into it. My advice – you have to practice every day. Just do it. No excuses. I’m putting this one up as a reminder to myself.